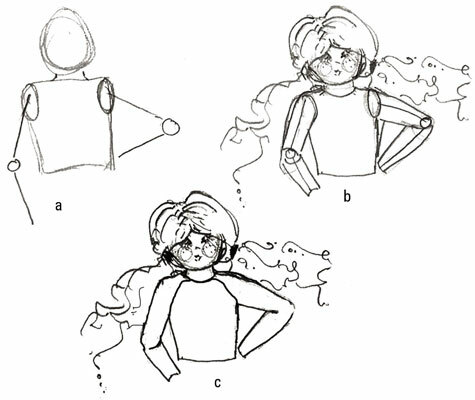 Kids’ arms are short and rounded, and they’re always purely functional looking in fashion drawings. No kid frets about how his arms look the way teens and adults do. Kids’ arms are meant for climbing, playing, and carrying, not for posing or preening. No cartooning when drawing kids’ arms: You’re drawing fashion kids who look hip like their fashion-forward parents. Draw a child’s torso with a head and armholes. Add short, straight arm lines with circles as elbows. Keep the arms relaxed and not necessarily on the hips; kids tend to just let arms fall in a relaxed fashion. Bent elbows fall a little above the waist. Add cylinders over the arm lines, keeping the circles to represent the elbows. Children’s arms are shorter in length and rounder in width than adult arms, so keep them chubby and stubby! Outline the child fashion figure and erase your initial lines.